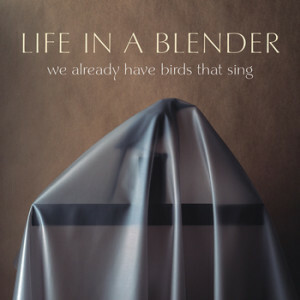 We Already Have Birds That Sing, the new CD from Life in a Blender, is an album of tunes developed through live performance, and perfected in the recording studio, with the addition of extra guitar parts, refined arrangements for the resident strings, and a hard-hitting horn section of guest artists. But the blood and guts of each cut on this, their 8th album, is the rock n roll core of drums, bass, and electric guitar propelling the singing that is voiced by the guy next door, with an affable lilt that can change to carnival barker or shrieking banshee on a dime. Life in a Blender arose in the post-punk art rock scene of the mid-1980s. The current lineup has been together over twenty years, with a loyal fan base that continues to grow, thanks to the inventive thinking man’s rock composed by an ensemble of veteran musicians, and the sneakily adroit lyrics of front man Don Rauf, which are like little short stories, filled with quirky characters defined by the imagery of a specific time and place, yet achieving the cathartic impact of broader human experience. 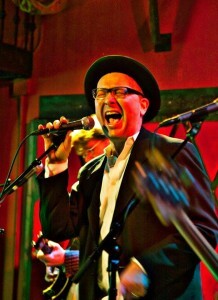 The album opens with a blast of raucous horns, leading into Tongue Cut Sparrow, a boisterous burlesque number, closely based on the published biography of a young Japanese-American singer who was initially forced to work as an exotic dancer at Forbidden City, a popular men’s club in 1950s San Francisco. Shunned by all her family, except a grandmother, she ultimately finds her voice and career as a chanteuse. But in Shards, the switch between outward appearance and inner reality is more poignant and more surprising, as the brass-driven funk of the first part underscores the growling declaration that, “I’m looking fine. I bump and grind…,”only to have the music and the singer suddenly stripped to the basic beat, as the violin rises up to play on the heart strings while accompanying the strained confession of regret. It is a classic example of just one life in a blender, found in the canon of this long-lived band of the same name. In the song Falmouth, a cheery fella imposes his unquenchable optimism on an emotionally distressed friend going through some unnamed crisis, and not taking no for an answer. A press release reveals information about the character’s specific situation. But Falmouth works so well on its own exactly because of the tight focus details of chicken, flowers, and roller derby, set before the background of ambiguous emotional circumstance. It allows a listener to connect the song’s sentiment with their own life experience, where they or one they care for has made similar efforts to reach someone in a bad place and pull them out. Often when immersing myself in a new record there is a tune that goes unnoticed, only to put a hook in me later on, so that it becomes a permanent part of the repertoire of fragments sung when cleaning the house or walking down the street. Falmouth is that song on this CD. I think it has something to do with the syncopation in the clean picking pattern from guitarist Al Houghton, in combination with the sporadic vocal harmony lines, and the smart and infectious interludes from the horn section, arranged by bassist Mark Lerner. Then again, the counterpoint underpinning Good Answer, which Lerner composed for cellist Dave Moody and violinist Rebecca Weiner Tompkins, is just as memorable, and it provides plenty of space for drummer Ken Meyer to fill up with tasty accents. Where that song is a flippant response to the bandwagon catch phrases of American pop culture, Frankenstein Cannot Be Stopped breathes new life into one of the most popular stories of gothic horror. The point of view is that of a member of the cinema audience, who is haunted by the tragic scene where the unintentional monster kills his youngest victim, and so he returns again and again to try to warn her from the dark. The album closes with Sea in a Sieve, a buoyant appreciation of the joys found in setting sail in a small vessel just for the fun of it. And like the record as a whole, it is a transportive entertainment that is worthwhile and enjoyable, but ends sooner than one might wish, leaving a taste for more. We Already Have Birds That Sing can be downloaded direct from the band’s website, for the indecently affordable price of $7, or you may order an actual CD for $10, which also includes the digital download. It is also available on iTunes and other fine music outlets. 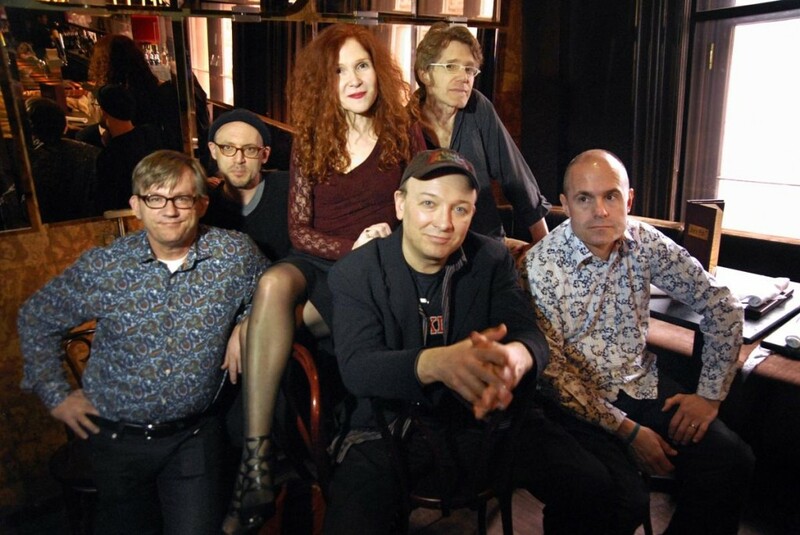 Here is a video of Shards, shot in concert at Joe’s Pub, at the Public Theater in New York City, and features the fledgling horn arrangements. You can see and hear how the song evolved, by comparing it to the video farther down, which was shot at Rockwood Music Hall several months earlier, when Shards was being performed for the very first time. You will have to get the album to hear the definitive version.